Above, a scene from the Washington, DC Regional FIRST Robotics Competition. Below, a student from Team Illusion talks about his experiences working on the robot. 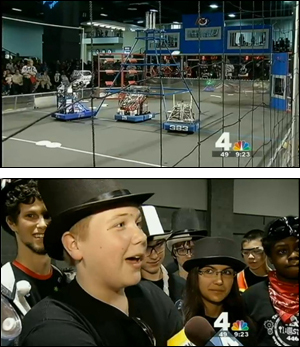 (Images courtesy NBC4, Washington, D.C.)Clark School of Engineering undergrads help middle and high school students prepare, compete. University of Maryland (UMD) undergraduates in the A. James Clark School of Engineering have been active in mentoring a local student robotics team that just earned a top position in the Washington, DC Regional FIRST Robotics Competition at the Walter E. Washington Convention Center on March 28-30, 2013. “Team Illusion 4464,” a FIRST Robotics Competition team comprised of middle and high school students from Maryland, was one of only three teams out of 58 participating in the DC regional competition selected to advance to the FIRST Championship Competition in St. Louis on April 24-27. Team Illusion also earned the Rookie All Star Award in recognition of the team’s success in its first year competing. Team Illusion benefited from the guidance and dedication of a group of University of Maryland undergraduate mentors called MASE (Mentors Advancing STEM Education). Clark School undergraduates Nitay Ravin (Electrical Engineering), Kanay Patel (Mechanical Engineering), and Yalun Wu (Electrical Engineering and Computer Science) started MASE with other students in October 2012 and have helped organize support for Team Illusion. MASE is comprised of 26 University of Maryland undergrads, advised by Dr. Betsy Mendelsohn, Director of the Science, Technology and Society (STS) program within UMD’s College Park Scholars academic residential community program. “College students benefit from mentoring children and teens in robotics,” said Mendelsohn. “They get to integrate and implement many of the skills we require in different courses, like planning, public speaking, group facilitation, and being resourceful. They also feel good, since the children's appreciation validates their own skills and engagement in engineering." College Park Scholars opened space in the Cambridge Community Center for MASE to meet with Team Illusion twice a week in October and November. Several of the MASE mentors are earning credit for service learning with Team Illusion by enrolling in sophomore practicum courses through College Park Scholars. The STS program, in particular, gives credits to about 25 undergraduates each year for helping robotics clubs at Greenbelt Elementary School and Martin Luther King Middle School, in addition to Team Illusion. UMD’s Maryland Robotics Center, directed by Associate Professor Nuno Martins (Electrical and Computer Engineering and Institute for Systems Research), has also played a key role connecting Team Illusion and other local FIRST Robotics clubs and teams with UMD students and resources. A highlight of this support was opening their weekly seminar on March 8 to a presentation by three FIRST Robotics Competition teams from Maryland, led by FIRST Director for Maryland Bill Duncan. Dr. Martins also has arranged for FIRST members to participate in an all-day workshop about robotics at the American Control Conference in Washington, DC, this June. UMD may also be eligible to host the Maryland Regional FIRST Competition, beginning in 2014 at the Comcast Center. Team Illusion’s 13 members are a mixture of home- and public-schooled students, most from Prince George’s County. The team has been mentored from the beginning by Naval Research Laboratory researcher Dr. Vijay Kowtha, who started the team with a grant from the National Defense Education Program and donated space in a building in Greenbelt, Md. for the team to work on their project during the FIRST robot “build season” of January-February. During the build season, the team met an average of about 24 hours per week. The additional mentoring and assistance from the UMD MASE group helped the group develop further and faster. Dr. C.D. “Dan” Mote, former President of UMD and current Clark School professor who has recently been nominated as President of the National Academy of Engineering, visited Team Illusion to watch the robots in action last week. He met students from Team Illusion and nearby Eleanor Roosevelt High School and their UMD mentors during their triumph at the DC Regional competition. Team Illusion’s next step is to raise $10,000 to enable their participation in the FIRST international competition in St. Louis during April 24-27, 2013. To learn more about the team, contact Dr. Vijay Kowtha at vijay.kowtha@gmail.com or visit: http://www.teamillusion4464.com. To support UMD undergraduate mentors to accompany the Team Illusion to St. Louis, contact Dr. Betsy Mendelsohn at bmendel@umd.edu. Team Illusion 4464 is a FIRST Robotics Competition team comprised of middle and high school students from across central Maryland. Team Illusion’s 13 members are a mixture of home- and public-schooled students, with most living in Prince George’s County. The team is seeking support to transport themselves and parent supporters to the FIRST Championship Competition in St. Louis on April 24-27. To learn more about the team, contact Dr. Vijay Kowtha at vijay.kowtha@gmail.com or visit: http://www.teamillusion4464.com. MASE is a University of Maryland student group comprised of 26 undergraduates from the Clark School of Engineering. The team actively supports and mentors younger students from K-12 programs in engineering-related activities, including robotics. The group is advised by Betsy Mendelsohn, Director of the Science, Technology and Society program within UMD’s College Park Scholars academic residential community program. For more information about MASE, contact Kanay Patel at kpatel10@terpmail.umd.edu. Every January, FIRST unveils the goal of the annual robotics challenge. Teams receive a kit of common parts that are used to build the core systems of a robot. Students work with hundreds of components, including programmable radio controllers, motors, electrical circuitry and mechanical parts, to build and program their robot for the competition. This year's competition involved programming robots to throw flying discs at a target. Following the six-week design and build phase, teams enter one of 50 regional competitions. The top finishers in each region are selected to compete in the FIRST International Championship in St. Louis. FIRST (For Inspiration and Recognition of Science and Technology) is a not-for-profit organization devoted to helping young people discover and develop a passion for science, technology, engineering, and math (STEM). The organization was founded by Dean Kamen, noted inventor and president of DEKA Research and Development, who visited the University of Maryland in 2008 to mark the 100th anniversary celebrations of College Park’s Electrical Engineering program. FIRST’s annual programs culminate in an international robotics competition and celebration where teams win recognition, gain self-confidence, develop people and life skills, make new friends, and discover new career path options. The FIRST Robotics Competition (FRC) challenges teams of students to raise funds, design a team “brand,” hone teamwork skills, and build and program a robot to perform prescribed tasks against a field of competitors.